We had five people online who were in Skype, so we decided to try the famous CLG Poke Comp. Ours would be slightly different, but still based on the same wonky strategy. The game started out better than I would have thought; all our lanes were winning. Despite picking a team comp designed for winning a game by sieging turrets, we were winning the laning phase! We actually jumped out to a 6-0 lead early in kills. However, a few well-executed ganks by the enemy team quickly took that lead from us. I had been sharing farm mid with Mundo as often as possible because we needed all members of the team to be strong, not just one or two. Also, if you share creep exp both parties actually get 55%, for a combined 110% exp gain, rather than just 100% creep exp gain from being solo. So by getting myself slightly behind early by sharing creep exp with Mundo I was actually catapulting him ahead of the enemy jungler. However, Vlad can become a monster very quickly if he’s left alone for too long. This is exactly what happened. He was cutting me in half through my MR runes and Chalice with just one slap of his Tides of Blood at max stacks and his Transfusion. It hurt. I would spell-shield the Transfusion, which actually helped to stack my Tear of the Goddess quicker as well. It also proved to be the most useful thing against Darius, as he was unable to pull the person with the Black Shield. However, I was falling behind Vlad early, and had to make up time. We were tied at 11 kills for each team, and I knew we needed to transition to our push strategy. First step in the strategy is to make sure all the tower are down. I ran bot with Mundo and we dropped bot turret. We transitioned and did the same thing for top and then grouped mid. By this point kills were tied at 16. We had traded two for three in bot lane, where we would have come out ahead, but we lost Elise in top lane to Lee Sin. At one point we were transitioning from Dragon to bottom lane and saw a Nunu. I snagged him with a snare from the other side of a jungle wall. Without any of us ulting or being on the same side of the wall as him we took him from full health down to less than 1/4 HP from just poke abilities, at which point he used Flash to create some distance. It was a nightmare of CC and damage. I don’t think my puddle was helping that much, but because it is MR shred, each ability (except for the Peacemaker) was dealing increased damage if I had a puddle down. As we were sieging their base I would put my puddle down in an area we didn’t want them to stand and they couldn’t stand there. Lux would do the same with her bubble, just completely zoning the enemy team from getting anywhere near us. Once we arrived at the Inhibitor Turret we didn’t want to get Darius pulled, so I would put a Black Shield on Caitlyn and she would walk forward and just auto the enemy turret while we kept key players away from her. 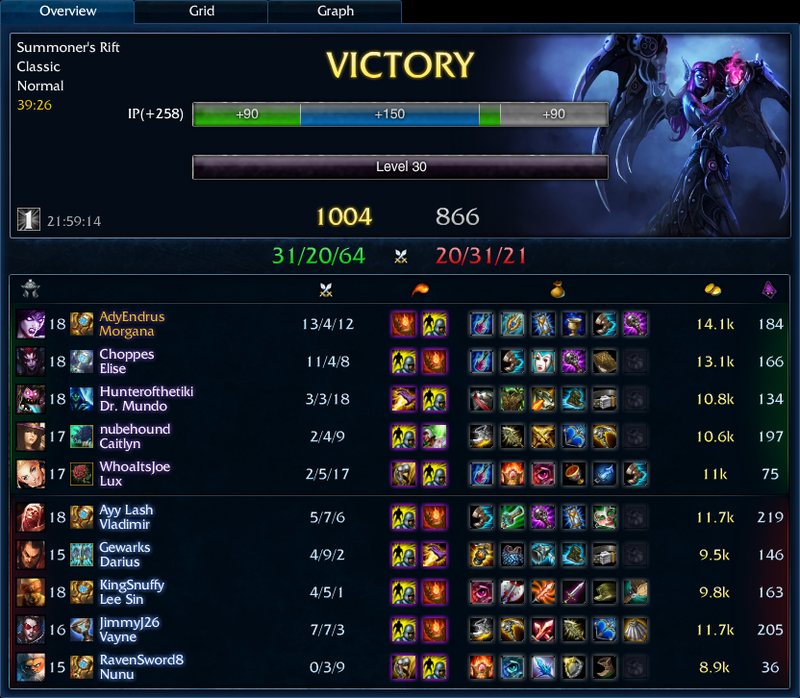 The best parts of that game was when we would catch Vayne with a snare, because she was dead. If we hit Vayne we would immediately commit. We could finish her off and it would be worth it because without her their team had almost no sustain DPS. If I landed a stun on Vayne I would puddle as I was walking towards her and I would press R. She would be dead before my snare expired. One of the times we caught her I walked forward, pulled tower aggro, made sure I had the other four enemy champions in my ult, and got ready to be blown up. I would eat Ignite, Vlad ult, and then, just as Darius was gracefully swan-diving onto me, I would press 3. Untargetable, suckers. It’s not a trick, every Morgana builds Zhonya’s, but not all of them use it correctly. The idea is to get the enemy team’s focus and wait until you will come out of Zhonya’s just as your stun completes. This way you can move around freely, but aren’t stunned useless while the enemy is stunned. This also helps to make sure you get the healing from your passive spell vampirism as you give the enemy less time to retreat if you aggro’d them correctly and they were trying to kill you. If you come out of ult and you’re in trouble, press 2. Seraph’s Embrace is a joke! The shield is huge, and it combined so nicely with Chalice to cost 1580 gold. Chalice of Harmony? More like Chalice of Broken! Spamming spells as soon as they were off cooldown and I’m full mana? Whoops. Best 1580 gold I ever spent! Ultimately, we snow-balled our strategy and our lead against this team to go from tied at 16 kills to a final score of 31 to 20. It had to be extremely aggravating for the enemy team. Luckily for us, Lee Sin read his build on SoloMid dot net which told him to build armor boots. That probably saved him from the auto attacks of our AP heavy team.